Domaine Les Aphillanthes from Travaillan, just northwest of Gigondas, has the special capability of jolting us into appreciation of the Côtes du Rhône region. Grower and winemaker Daniel Boulle's terroir driven southern Rhône wines are exemplary models of perfect fruit and minute yields. The roots of their vines grow as deep as 30 meters, (about 100 feet)! 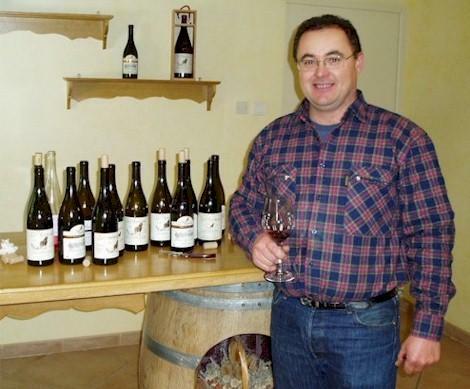 His approach is to focus on the quality of the fruit in the vineyards together with minimal intervention in the winery. Fermentation is in concrete vats; the wine is moved about by gravity. No filtration. Daniel, the 4th generation at the domaine, inherited the estate's 10 hectares in 1987 and has increased it by acquiring exceptional parcels, inclduding one in Rasteau planted in 1921. Since 2003, the estate has followed biodynamic principles and since 2007, the domaine has been certified as biodynamic (Biodivin) and organic (ECOCERT). Deemed by Robert Parker as "one of the finest estates in the southern Rhone, making which may be the richest Côtes du Rhône I have tasted." The Boulles do not try to emulate other growers. Terroir expression and balanced fruit qualities can be felt in all Aphillanthes' wines.